To solve this issue we need to do two simple things – create a listener-class (InitializationListener) and register a listener for this class in the web.xml file. Here`s how the solution is describes in the Oracle’s documentation. You can specify the system property as an operating system environment variable or Java command line option, but the recommended approach is to set up a web application filter, using the steps below. // Set the SQL Builder to the correct value for your database, SQL Server in this example. 2. Set up a Web Application Filter Edit your application’s web.xml file and add <listener> tags containing your servlet context listener class. This causes your listener to be executed every time the application starts up. Note: The application module’s configuration has ajbo.SQLBuilder property, but setting it has no effect. See the topic below. The workaround is to specify jbo.SQLBuilder as a system property instead of an application module configuration option. This will cause the application module to pick up the value from the system properties instead of using the default value (Oracle). However, specifying the system property as an OS environment variable or Java command line option comes with high administration overhead. The best solution is to set up a web application filter in the web.xml deployment descriptor and define the system property there. For example, the servlet context listener in the following sample will set the system property for the web application. 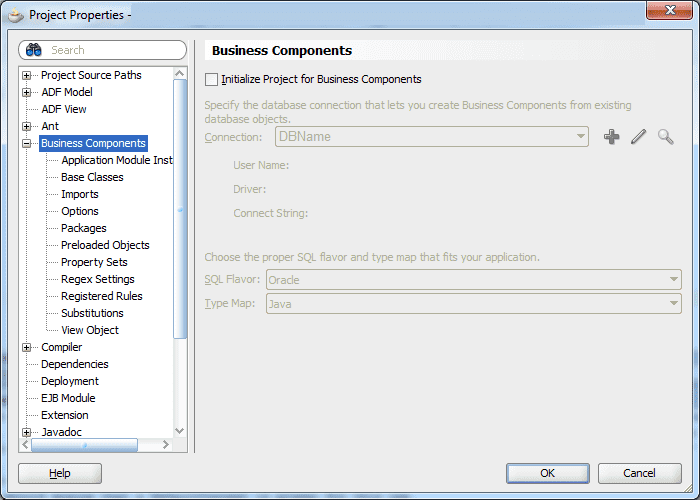 * You can check the SQL Flavor and Type Map opening project properties and navigate to the Business Components. What is your usual approach, share in the comments below.